This morning I was going out on a quick jog before work, and I wore my Nike headband to keep my ears warm. I was jogging along, happy as a clam, and then my left ear bud started getting caught in the headband. I tried to quickly adjust it, and in the process it came out of my ear and was flopping around. Before I knew it it was caught in the chain length fence, and RIPPED FROM IT’S CORD! WHAT! 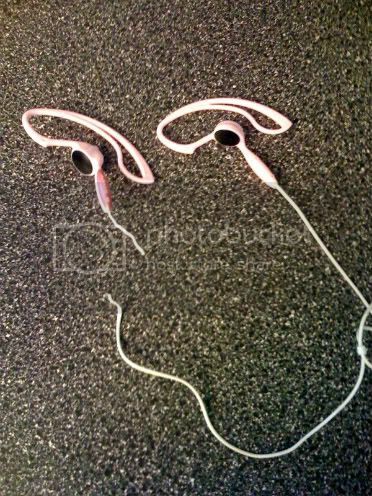 I loved my ear buds, so I’ll be soon purchasing a new pair. I completed the run with one ear bud, and oddly enough it was kind of a good idea because I was much more alert to my surroundings. But seriously, I run along side a chain length fence for about 200 meters of my 3 mile run, and it got ripped apart so easily. I wish I had my camera on my run because I turned around, and the ear bud was just hanging there on the fence. Though sad, I had to laugh. I got home and took a picture of the lone bud, that’s what you’re seeing above. So besides that, I wanted to reward my chic readers! I’m hosting my very first giveaway! 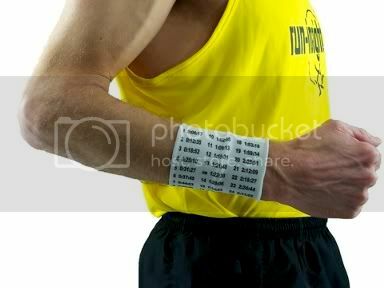 I’m going to be giving away a personalized Marathon Pace Band from Marathon Pace Band.com. I know I have many marathoners out there, and if you don’t already have one, you need to get one, so enter my drawing! I know running even mile splits is very important when you run a marathon, especially to meet your goal. It can also be difficult to remember twenty-six splits. This little guy is all yours and personalized with your goal time, splits to match the goal, and your personalized inspirational message! All you have to do is leave a comment with your Personal Record, and what race you got it at. Enter by next Friday, the 31st and I’ll draw the winner on Monday! Good luck to all the racers out there this weekend. I’ve decided to run a few shorter races around town in between now and the Huntington Beach 1/2. I will be doing the Long Beach Turkey Trot, in which I haven’t decided if I am going to run the 5k or 10k yet, and I will also be doing the Quench the Fire 5k at El Dorado Park in Long Beach on December 7. Tomorrow, Tomorrow, I’ll love you….